Though it has a jazzier look, the Activité Pop holds all the same functions as its predecessor. A smaller dial sits beside the main clock face, and shows the progress made against your daily fitness targets, including steps, calories, and all that good stuff. The smart watch links to your phone via Bluetooth, working with the Withings HealthMate app to track you through the day. It'll even recognise automatically what you're doing, whether it's walking, running or even swimming. And yes, it's waterproof to 30 metres. Though it takes the appearance of an ordinary watch, the device has combined the best elements of both smart and analog watches. One of the analog elements of the Withings watch is its battery, which means there's no need to recharge the device. It should last 8 months and is generally cheap to replace. Despite having exactly the same functions as the original, the Pop is by far cheaper with a £119.95 price tag, compared to £320 for the Activité Sr. The differences lie in the appearance and materials of the watch. While the Activité had a sapphire glass dome and calf leather strap, this younger brother has mineral glass with PVD coated display and a silicone strap. Less glamorous perhaps, but the price tag clearly benefits, without taking too much away from its sleek appearance. 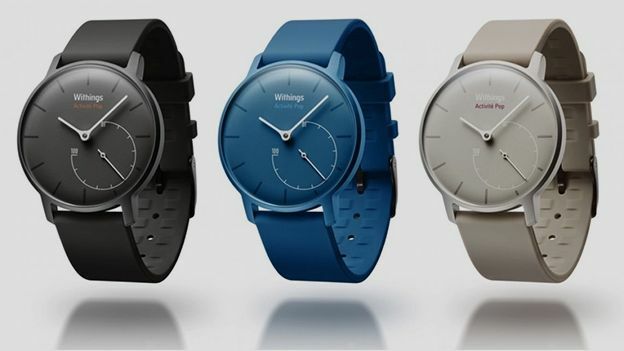 The watch comes in three different colours: blue, black and grey, but there are plans to release more after the Pop becomes available on theWithings website from March. Here's hoping the Activité might become available before then as well.